Gibson ETG-150 Model Arch Top Hollow Body Electric Tenor Guitar (1940), made in Kalamazoo, Michigan, serial # 938F-4, sunburst top, dark back and sides finish, maple back and sides, spruce top; mahogany neck with rosewood fingerboard, period black hard shell case. 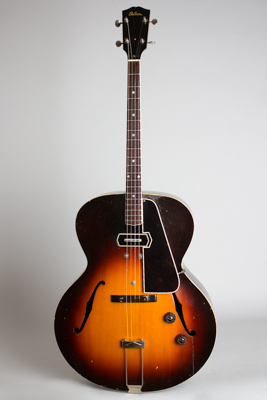 The "standard" 6-string pre-war Gibson ES-150 is one of the most important electric guitars of all time; this is the very rare 4-string tenor version built only in limited numbers. Besides its historical value, the ETG-150 is a great and unique sounding instrument, certainly one of the very best electric 4-strings ever built. The ES-150 was the first really commercially successful electric Spanish guitar and the progenitor of the entire future Gibson electric line. Many of the early electrics from Gibson's competitors in the 1930s have a rather mongrel look. While not a fancy guitar, the 150 has a beautifully understated elegance that undoubtedly helped it gain acceptance on the formal bandstands of the time. This particular ETG-150 is a later model from 1940, the last year this version was listed for sale. It mounts a 4-string version of the famous "Charlie Christian" bar magnet pickup featuring a triple-bound top edge and a 3 separate blade pieces under the strings, designed to improve string balance. The slim neck has a light "V" profile and a bound, dot-inlaid rosewood fingerboard. Other standard features include the "radio" style knobs, unique jack-in-tailpiece unit, smaller adjustable wooden 4-string bridge and the single-bound celluloid pickguard. The only notable difference of this late model from earlier examples is the tuning pegs; this guitar mounts more convenient guitar-style single unit pegs instead of the backwards facing banjo tuners used on the first models. The standard 6-string ES-150 remains indelibly associated with Charlie Christian; this 4-string variant was the instrument of choice for Tiny Grimes, his contemporary and acolyte in the Harlem-based jazz scene of the time. This is a wonderful and fine-playing example of this rare instrument; less than 100 of these 4-string 150s were made, and they remain the ultimate in a pre-war electric tenor. Overall length is 38 5/8 in. (98.1 cm. ), 16 in. (40.6 cm.) wide at lower bout, and 3 5/8 in. (9.2 cm.) in depth, measured at side of rim. Scale length is 22 3/4 in. (578 mm.). Width of nut is 1 1/4 in. (32 mm.). Overall this is a very clean, all original, and great playing guitar, one of the nicest examples of this rare 4-string we have seen. There is light general wear to the finish, most notably a strumwear spot on the front edge of the pickguard into the wood that has had some touch-up up applied. Other than that, the finish shows just small dings and scrapes. There is an old spruce grain crack repair off the treble side f-hole that is fairly visible, and a couple of neat and discreet crack repairs to the flat back. Still a very lovely example; simply one of the coolest 4-string guitars ever and as splendid an electric tenor as they come. Excellent - Condition.